Dave Crooks Founder and Designer at Dodge Roll has taken to the official PlayStation blog this week to announce that their game Enter the Gungeon will be exploding onto PlayStation 4 consoles in a few months time on April 5th 2016. When Enter the Gungeon it will allow players to choose from 190 player-usable guns, ranging from pistols and rifles, to laser and beam weaponry, check out the gameplay trailer below to see what you can expect from the new PS4 game. When I look at our game in its finished form, I feel incredibly proud of what our small team has been able to accomplish over the last two years. The game is so much bigger than our original vision, but it is also much better, more robust, and with more variety. 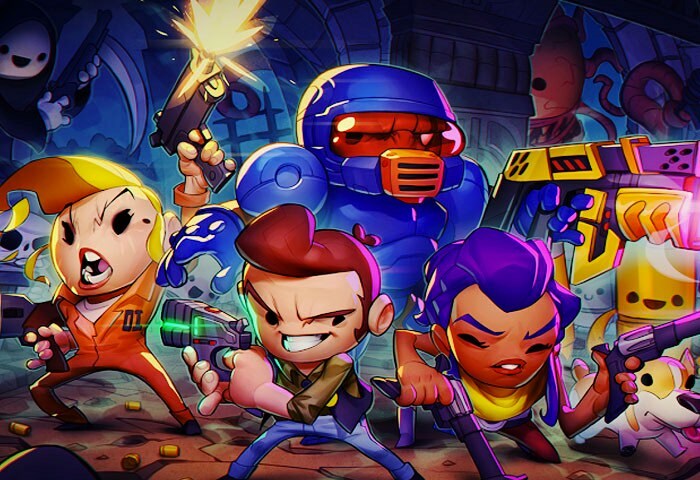 Enter the Gungeon will launch with 190 player-usable guns, ranging from pistols and rifles, to laser and beam weaponry, to much crazier weaponry as well. We have a gun that shoots sharks, a gun that shoots bees, a unicorn horn that shoots rainbows — there is a gun that can turn enemies into chickens, and another that might turn them into snakes. You can spread oil all over the floor with the Fossilized Gun, light it on fire using the Flare Gun, and put it out using the Water Gun, then freeze the water using the Freeze Ray. The loot you find in Enter the Gungeon isn’t just guns though, there are 200 items as well that can provide permanent buffs or temporary advantages. You might get the Shock Rounds that create an arc of electricity between the shots you fire, or the Heavy Bullets that make all of your bullets larger and slower, but more powerful. You might find a cardboard box to hide in and get the jump on enemies, or a roll of duct tape that binds two guns together. For more information on the new Enter the Gungeon jump over to the official PlayStation Blog website for details via the link below.